A new study by Yeager et al. (2016) tested the effects of preparatory lay theory interventions to reduce racial, ethnic, and socioeconomic achievement gaps when students enter college. 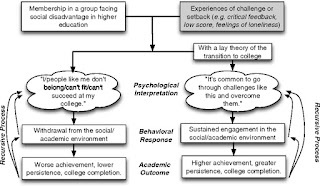 Lay theory interventions are interventions aimed at helping students understand that challenges in the transition to college are common and improvable and, thus, that early struggles need not portend a permanent lack of belonging or potential. Often, these interventions are done when students are already at college. Preparatory lay theory interventions are done before students have entered college. As the study suggests they work. The picture on the right shows why. These interventions help people explain struggles and problems in a different and more constructive manner which helps them to respond more effectively to them and to be more successful. Abstract: Previous experiments have shown that college students benefit when they understand that challenges in the transition to college are common and improvable and, thus, that early struggles need not portend a permanent lack of belonging or potential. 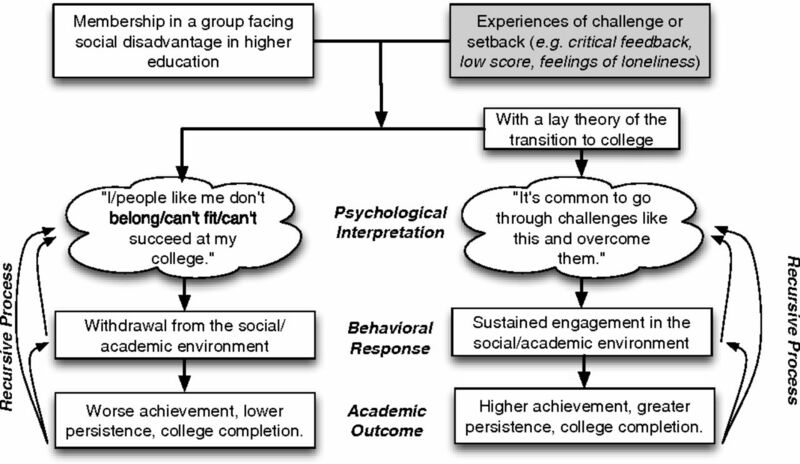 Could such an approach—called a lay theory intervention—be effective before college matriculation? Could this strategy reduce a portion of racial, ethnic, and socioeconomic achievement gaps for entire institutions? Three double-blind experiments tested this possibility. Ninety percent of first-year college students from three institutions were randomly assigned to complete single-session, online lay theory or control materials before matriculation (n > 9,500). The lay theory interventions raised first-year full-time college enrollment among students from socially and economically disadvantaged backgrounds exiting a high-performing charter high school network or entering a public flagship university (experiments 1 and 2) and, at a selective private university, raised disadvantaged students’ cumulative first-year grade point average (experiment 3). These gains correspond to 31–40% reductions of the raw (unadjusted) institutional achievement gaps between students from disadvantaged and nondisadvantaged backgrounds at those institutions. Further, follow-up surveys suggest that the interventions improved disadvantaged students’ overall college experiences, promoting use of student support services and the development of friendship networks and mentor relationships. This research therefore provides a basis for further tests of the generalizability of preparatory lay theories interventions and of their potential to reduce social inequality and improve other major life transitions.